In this flavorful and healthy Instant Pot Thai Peanut Noodles with Chicken recipe, plain spaghetti is elevated to the next level with a homemade vibrant Thai peanut sauce. This Thai Noodles in Peanut Sauce recipe can be made vegetarian by omitting the chicken and substituting fish sauce with soy sauce. This Healthy Instant Pot Thai Peanut Noodles with Chicken recipe is my take on a Thai restaurant favorite. 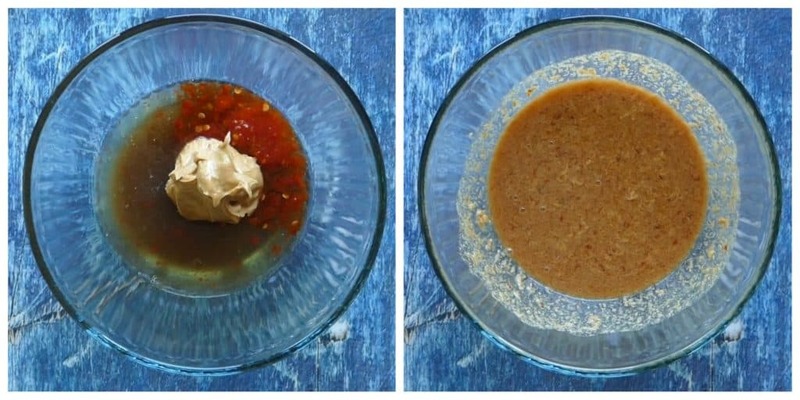 Rice wine vinegar, brown sugar, and chili garlic sauce gives the Thai peanut sauce its delicious tangy, sweet, spicy flavor. When I prepare this recipe on the stovetop, I make it with rice noodles or chow mein noodles. However, pressure cooking those kinds of noodles in the Instant Pot would turn them to a gelatinous mush, so I substitute spaghetti. The spaghetti holds up to pressure cooking with the peanut sauce and still has a chewy consistency. 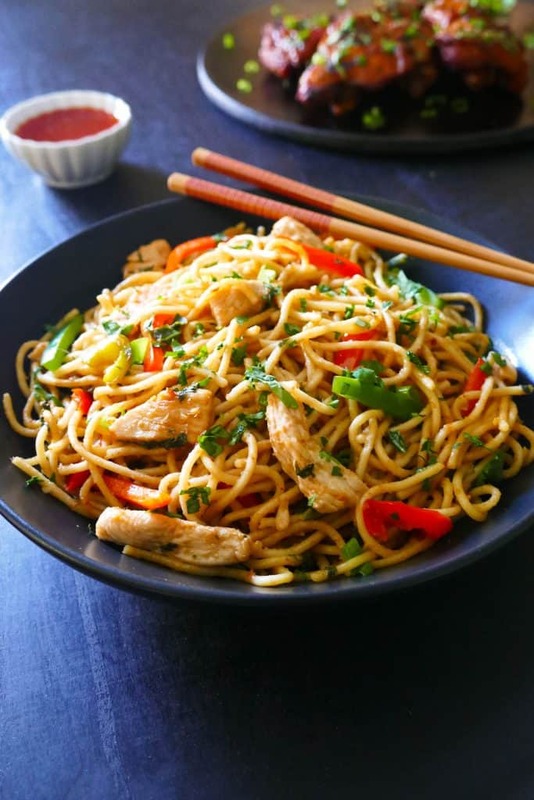 I love to serve these noodles as a main dish but I also like to serve them as an accompaniment to my Instant Pot Thai Grilled Chicken (Gai Yang) or other grilled dishes. In that case, I omit the chicken and just use veggies. Of course you could make this recipe on the stovetop, but I love the convenience of cooking the noodles and sauce together. Less mess, and there’s no need to watch over it. Just add the ingredients and walk away! 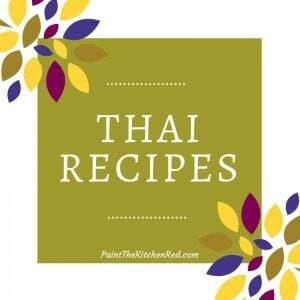 Click Below to Check out all my Thai Recipes! The Thai peanut sauce has a bold tangy flavor that my family loves. If you’re not a big fan of tangy flavors, I would suggest that you add half the quantity of lime juice before cooking and add more at the end, to taste. To make this dish vegetarian, you can omit the chicken and add some extra veggies. Substitute fish sauce with soy sauce. No other changes are needed to the recipe. Rice wine vinegar is also called rice vinegar. For the fish sauce, I like the quality of Red Boat fish sauce. You can find it at Asian grocery stores. But it is more expensive than other fish sauce brands. Tiparos is another brand of fish sauce I’ve used – it’s more affordably priced. There’s no substitute for fish sauce. It adds that depth of flavor, the umami, to the dish. But if you’re vegetarian, I’ve had readers recommend the Fysh brand of sauce. I have not tried it. You may need to add a little extra. The spaghetti I use for this recipe is Barilla Spaghetti No. 5 which is a medium thickness. Its stovetop cook time is 9 minutes. If the cook time listed on your package is different, you may need to change the pressure cook time. Spaghetti tends to clump together when cooked in the Instant Pot. You can reduce the clumping drastically by spreading out and layering the dry spaghetti in a criss-cross pattern. If there are still clumps when pressure cooking is completed, stir the spaghetti and separate the clumps using a fork. You may find that there’s extra liquid when you open the Instant Pot. Just allow the Instant Pot Thai Peanut noodles to rest for a few minutes and they should thicken up nicely. I like to use the Huy Fong brand of chili garlic sauce. It has a tangy, garlicky flavor that I love. You could substitute sriracha sauce or sambal oelek, but they don’t have the same garlic flavor so you may need to add some garlic. I occasionally add chopped peanuts as a crunchy topping. 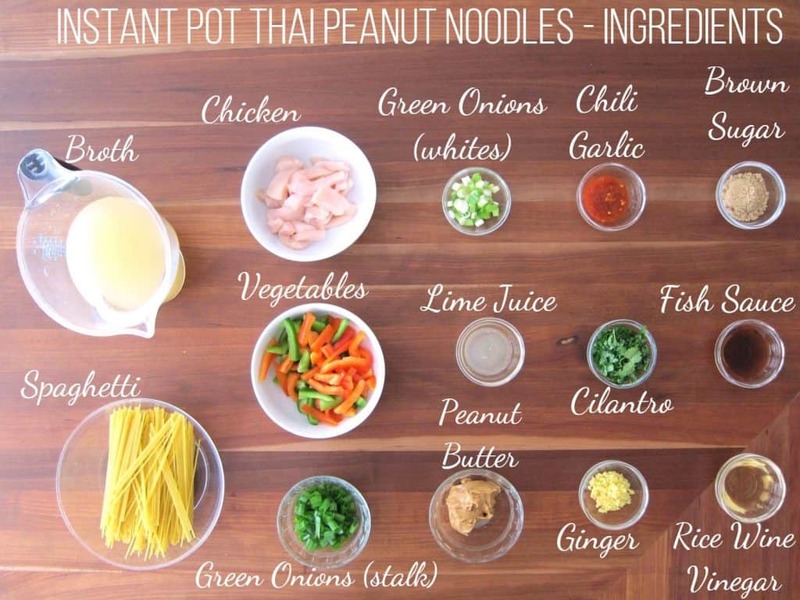 If you’re new to the Instant Pot and aren’t familiar with how to use it, please read the Instant Pot DUO Beginner’s Quick Start Guide or the Instant Pot ULTRA Beginner’s Quick Start Guide first and then come back here to learn how to make this Instant Pot Thai Peanut Noodles with Chicken. In a medium bowl, combine rice vinegar, chili garlic sauce, brown sugar, lime juice, fish sauce, and peanut butter. 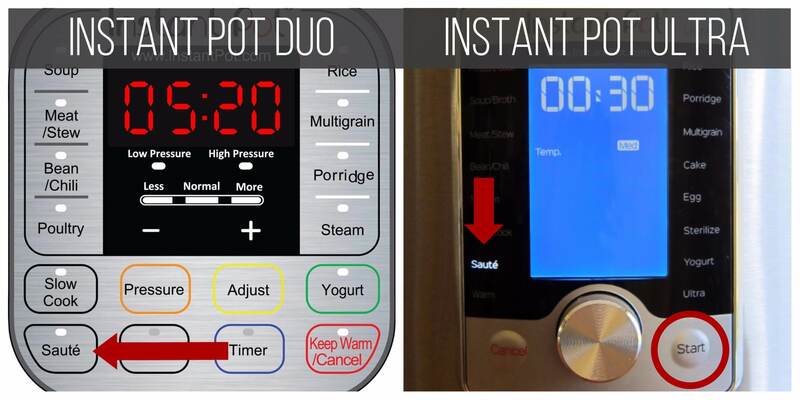 Instant Pot DUO: Select the ‘Saute’ function. Instant Pot ULTRA: Select the ‘Saute’ function and press ‘Start’. Once the Instant Pot has pre-heated, add oil to the inner pot and allow it to heat up. Add bell peppers and carrots or any vegetables of your choosing. Press ‘Cancel’ to turn Instant Pot off. Deglaze with a couple of tablespoons of broth if there’s anything stuck to the bottom. Stir in remaining broth and reserved peanut sauce. * If the Instant Pot becomes too hot and the ingredients are burning, turn it off to cool it down and turn back on once cooled. Add a tablespoon of broth to deglaze the inner pot if you find that the ingredients are browning too quickly. Add one-third of spaghetti into the inner pot, spreading it out vertically. Add the next one-third of spaghetti, spreading it horizontally. Add the final layer, spreading out vertically. Using a spatula, push down on spaghetti until submerged in the liquid. Press ‘Manual’ (or ‘Pressure Cook’) and ‘+’ or ‘-‘ until the display reads ‘6′ (6 minutes). Select Pressure Cook mode and adjust time to 6 minutes (00:06). The display will count down from 6 to 0; it will then switch to ‘Keep Warm’ mode and display ‘L0:00’ or ’00 00′ and begin to count up. Once pressure cooking is complete, wait for 2 minutes and release pressure. Move the steam release handle to ‘Venting’. I like to place a folded towel over the steam release handle and move it to the venting position. Remove the towel after turning the knob. Press ‘Cancel’ and open the Instant Pot. Press down on the Steam Release Button until it locks into place, and steam begins to come out of the Steam Release Valve. Stir the Instant Pot Thai peanut noodles and if there are any strands of spaghetti stuck together, use a fork to separate the strands. Add back the reserved sauteed vegetables, cilantro and green onion stalks. If you find the noodles to be too liquidy, allow them to rest for 3 to 5 minutes, and they will absorb the extra liquid. Instant Pot Thai Peanut noodles is my take on a Thai restaurant favorite. In this flavorful dish, plain spaghetti is elevated to a different level with a vibrant peanut sauce. 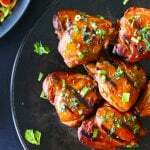 Rice wine vinegar, brown sugar, and chili garlic sauce give the dish its distinct tangy, sweet, spicy flavor. 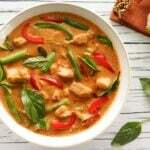 This dish can be made vegetarian by omitting the chicken and substituting fish sauce with soy sauce. In a medium bowl, combine rice wine vinegar, chili garlic sauce, lime juice, brown sugar, fish sauce, and peanut butter. Stir with a whisk until well blended and set aside. Select the ‘Saute’ function and pre-heat the Instant Pot. Add oil to the inner pot and saute the bell peppers and carrots until tender-crisp. Remove with a slotted spoon and set aside. Saute ginger, green onions (white parts only), and chicken until chicken is no longer pink, about a minute. Add more oil as needed. Deglaze with a couple of tablespoons of broth and scrape any brown bits stuck to the bottom of the inner pot. Stir in remaining broth and the reserved peanut sauce. Divide spaghetti into three batches. Add spaghetti to the inner pot in a criss-cross pattern: add one-third of spaghetti into the broth, spreading it out vertically. Add the next one-third of spaghetti, spreading out horizontally. Add the final layer, spreading out vertically. (see blog post for step by step photos). Using a spatula, push down on spaghetti until submerged in the broth. Close the lid and pressure cook for 6 minutes. Do a 2 minute natural pressure release (NPR 2). Press 'Cancel', open the lid and stir the noodles. If there are any strands of noodles stuck together, use a fork to separate the strands. Add in the reserved sauteed vegetables, cilantro, and green onion stalks. Prep time does not include steps that are already accounted for in the ingredient list, e.g. minced garlic, cut vegetables, etc. * If you find the noodles to be too liquidy, allow them to rest for 3 to 5 minutes, and they will absorb the extra liquid. how many oz. by weight is “1 cup of skinless boneless chicken?” I’m guessing between 5-8 oz. by weight. Is that right? Thanks. This recipe looks delicious. Mark, I would say about 1/2 lb. I use about 2 boneless skinless thighs or one chicken breast. Hope you like the recipe. Made this tonight, it was excellent. I used a pound of chicken, half a green pepper, half a red pepper, and a couple medium carrots. If the spaghetti doesn’t push down into the liquid, add some more broth, it will get absorbed. There is cilantro in the photo of ingredients, but not in the list. Might want to fix that. Tom, thank you for your comment and rating! Oh, I’ll have to change that – I have all these checklists for my recipes; how did that one get past me?! Thank you!! Made this last night. Once I figured out what 1 cup of chicken equates to, more or less, it was really easy. Really delicious and the kids liked it too. (My 5-year-old protested and refused to try it at first. But once he did he like it). Haha, sorry John! I will make a note in the recipe and add the weight 🙂 Thank you for commenting and rating the recipe – that gives others good information if they’re unsure about the recipe! 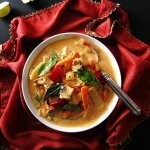 I find your recipes awesome, and easy to make for a cooking novice! Ben, I think you should be good. If you wanted to play it safe, you could add some extra liquid and it will probably get absorbed while it’s resting. Thanks for your kind comment! Hi Larry and Els – sorry about the serving size! I guess if you’re eating it as a main dish, it might not go too far. Thanks for the feedback! My husband and I loved it. My one concern it was a bit on the dry side. Any ideas? Carol, sounds like you may need some more liquid next time. It could be due to various reasons, including type of ingredients, evaporation, etc. But I would try to add another 2 tablespoons of liquid when you’re cooking. I find that even if there’s extra liquid after pressure cooking, it gets absorbed by the pasta as it sits. Thanks for your question. Made this last night….I am lucky to have a huge Asian Market about 15 minutes away….so finding ingredients is a breeze. Great recipe….very easy….definitely on my repeat list. Awesome, Diane! I love the quickness of the recipe too! Ahhhh-mazinggg!!! Followed the recipe exactly and my family couldn’t stop raving about it! I love the step by step guide and made it in my Ninja Foodi. Thanks so much for all the time and effort in making dinner nights so much easier! Thank you for the kind words, Sombra! It’s my pleasure to share recipes that people enjoy making for their families! 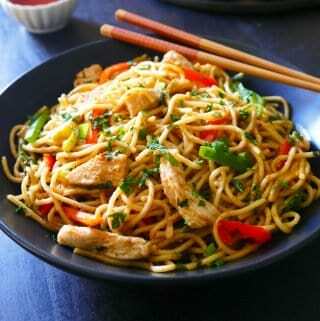 Could I make this with whole Wheat noodles? I’ve never tried it but you’ll need to change the cooking time: divide the box cooking time by 2 and add 1 minute. Good luck and let me know how it goes! This my first recipe in my new instant pot and it came out great! I was craving Thai and looking for something with a spicy peanut sauce and plenty of veggies. I ended up making a lot of substitutions because I did not have all of the ingredients in my home but still turned out perfect. I ended up using crunchy peanut butter because it was all I had and i thought it added a very nice texture! Miranda, I’m so glad you liked the recipe. I can see how crunch peanut butter would work because some Thai noodle dishes do have chopped peanuts. I have made this four times in the last month! It is now one of my favorite meals to make. I use my 8 Qt Instant Pot. I double the recipe, except triple the sauce, as I love lots of sauce. This way, you use the whole package of noodles and broth. What a great comment, Veronica! Thank you for taking the time. I’m glad you like the recipe and thanks for sharing your modifications. This is the 1st recipe I made from this site. Delicious, full of flavor and super easy to make. I doubled the recipe and it fed 6 (3 kids, 3 adults… and we’re not huge eaters). This is better than what you’ll get in a restaurant AND you can add more of your own personal favorite veggies to it. This recipe will be a regular for my family.